Each week I receive Google News Alerts from around the globe, urging me to click their link and read many foreign language articles on Terrafugia's groovy roadable airplane, the Transition. Today one came in from Italy that looked interesting. The only glitch is that I do not read Italian. "If the dream of the man is that one to fly, the dream of who goes to work is that one to avoid the ingorghi, exiting in all serenity from the garage of house without the incubus of the tails overhead. A little as remembered (them) the protagonists of the series to futurist animated designs of the Jackson's. The dream now has become truth. It will even pass still a little than time before being able to go in some store and to order it (or to order it), but we will not perhaps have not to wait for too much. 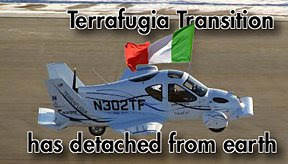 The car that flies, or the airplane that moves on the earth like an car, is indeed and Terrafugia Transition is called." "The Terrafugia Transition has detached from earth in order only 37 second ones, a time similar to that one of the first flight of the Wright siblings, it has made but it in “a thus normal” way to make to think that yes, the future is the much nearest one. The frontal sight evidences one of the particularities of this hybrid vehicle, that is the configuration with surface canard, that is the front position of the horizontal stabilizers, the small fins that seem of the moustaches and characterize also from the aesthetic point of view the Transition. An other curiosity, for that it regards the aeronautical part, is discovered watching it from the posterior part: own because draft of means that must also travel on road, and the driver must therefore be had the possibility to see how much happens to its shoulders, not is an only tail and centers them, but the tail is double, decided laterally regarding the fuselage, or nside that to say it wants. At last the propeller: it has posterior position, and obviously it centers them, but during the automotive march it is not of intralcio to the guide." "Of the Transition the things are many that they hit, but that more detail regards the halves wing without a doubt. The change of configuration, from car airplane, happens in second 30 (a time similar to what the ones of a cabriolet must attend for the opening or the closing of the canopy), and the video that appears on the situated interesting of the Terrafugia is indeed illuminant. The speed on the four wheels is of 65 miles hour, to the maximums of the speed concurred on the American roads. As aircraft has a cruise speed of approximately 185 km/h, a speed of spin (that is that to catch up in order to carry out the takeoff) of 130 km/h, and in order to detach itself from earth have need little more than 500 meters. The stall speed that is approximately 83 Km/h, while in flight it has an important autonomy, that is 450 miles, little more than 700 kilometers. That, as an example, it could concur to everyone of we, to exit from the garage to Brescia, to arrive to Montichiari, to enter in track, to take off, to land to Fiumicino and to arrive until in center to Rome without having to change half of locomozione. 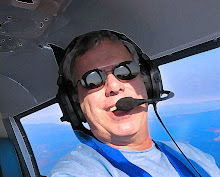 Not but those of the dimensions, substantially similar to a Piper PA 28, even if slightly more reduced." Now this is indeed progress. I mean, really, haven't we all been looking for a better way to get from our garage in Brescia to arrive until the center of Rome without having to change half of locomozione?